Purely Ageless™ is an age defense moisturizing cream formulated with organic ingredients as well as an impressive botanical ingredient list including the finest quality of essential oils. Purely Ageless™ utilizes hi-tech expertise and the safety of natural ingredients to support graceful aging. Oasis Serene Botanicals is very pleased to introduce naturopathic practitioner and clinical herbalist, Loretta Lanphier’s, exclusive age defense crème, Purely Ageless™. Purely Ageless™ combines hi-tech technology with the latest anti-aging ingredients – natural and non-toxic ingredients that heal, repair and restore the skin to its natural beauty. What is Purely Ageless™ Age Defense Creme? 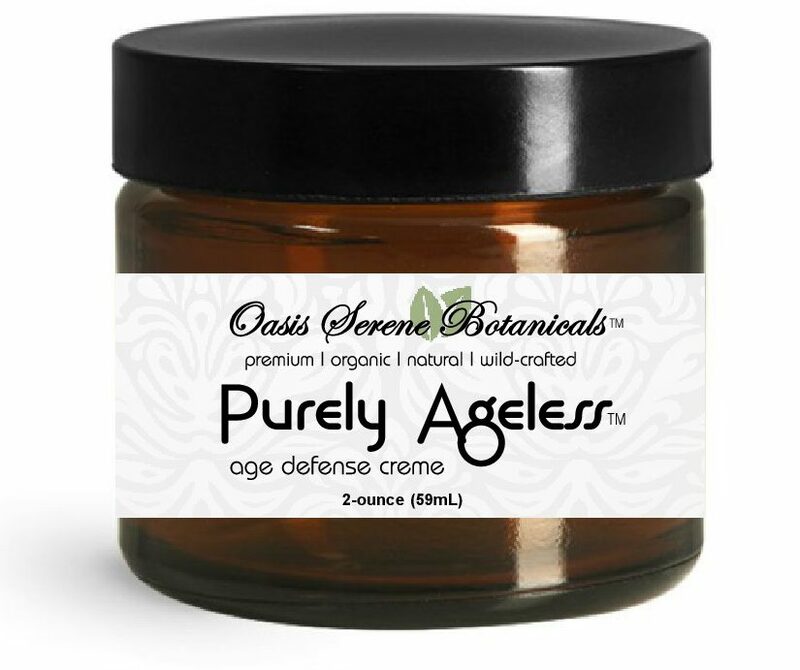 Purely Ageless™ is a natural and organic age-defense creme that’s deeply moisturizing, intensely rich in skin nutrients and enriched with exotic botanicals. With ingredients such as vitamin-rich mango seed butter and powerful skin-loving shea butter, organic rosemary, and organic neem seed oil as well as soothing white willow bark and more, you will love this worry-free formula that’s been carefully crafted to melt into your skin to bring the look and feel of total hydration and intense nourishment. Purely Ageless™ helps to relieve even the driest skin, leaving it with a smooth, hydrated satin sheen. An added bonus of our special blend of essentials oils promotes the feeling of calmness and well-being, with renewed tranquility. Purely Ageless™ will take you from Stress to Calm (both day and night) with just one application – a great reason to never be without it. Formulated by naturopathic practitioner Loretta Lanphier for those who truly want an age-defense crème that is soothing, refreshing and safe. Made in small batches. Always fresh. Made in an FDA certified and Organic-certified facility and in compliance with current Good Manufacturing Practices (cGMP). No worries about contamination or adulteration that “home made” products may incur. Made with 100% natural and organic ingredients. Purely Ageless™ is 90% organic. Our high quality natural ingredients include the finest essential oils, organic herbs and plant oils in their natural state and cold-pressed. These ingredients are used to create well-balanced, holistic and nourishing formulations that we consider to be naturally healthy for the skin. Oasis Serene Botanicals does not use FD&C colors, which are used in some skincare products, due to their negative effects on our health. We do not use toxic foam-boosters, toxic emulsifiers, toxic perfumes or toxic preservatives. Oasis Serene Botanicals lists every ingredient. No surprises or guesses. No compromises. Oasis Serene Botanicals products do not contain: Petroleum products (mineral oils, paraffinum); PEG (PolyEthylene Glycol); Sulfates (Sodium Laureth Sulfate); Parabens (methyl-, propyl-); or Sodium Benzoate. What sets Purely Ageless™ apart from other “natural” anti-aging creams? Naturally hydrates and moisturizes into the layers of the skin. Contains botanicals & essential oils that have been used through the ages to keep skin healthy and radiant! Antibacterial, Antiviral and Antifungal in nature. Provides vitamins, minerals and essential nutrients to the cells. Can be worn under make-up for a flawless look. Promotes natural and radiant looking skin. One of the most important factors that attributes to skin wrinkling is the amount of sun exposure to the skin. While sun exposure is very necessary for health and well being it can also dry out the skin and, if protection is not adequate, lead to free radical damage to the skin cells. Many say that the sun is the number one detriment to the skin. However, this is not always true! The sun is actually a friend to your overall health and well-being as well as to your skin as long as overexposure is eliminated. It is estimated that 90% of what we normally think of as signs of age are in reality signs of sun overexposure. We highly recommend getting 30-40 minutes of unprotected sun each day before 10:00 am or after 3:00 pm. For other times when sun exposure will be longer, we suggest using a natural sunscreen for safe and effective skin protection. For after-sun natural skincare we recommend HydraTone™ to keep your skin healthy and hydrated. Healthy Diet – No matter what professionals say, your skin will reflect your diet! Include lots of organic fruits and freshly juiced vegetables. This will provide your skin with nutrients, water and oxygen. Whole grains, seeds, nuts, healthy oils, essential fatty acids and legumes will also prove beneficial. Hydration – Drink at least ½ of your body weight in ounces of spring or distilled water with 2 tablespoons of organic apple cider vinegar (mixed in one gallon of water) every day. This will help to hydrate the skin and flush away toxins. Healthy Oils – Consume Essential Fatty acids in the form of healthy oils such as coconut oil, hempseed oil, flaxseed oil and olive oil. Enzyme Supplementation – Enzymes reduce chronic inflammation which is a major aging factor and a primary contributor to death. Around the ages of 30-35 most people have a reduced amount of available enzymes. A good proteolytic (protein digesting) enzyme formula is recommended. Smoking & Caffeine – Eliminate smoking and avoid, as much as possible, alcohol and caffeine. These substances actually contribute to dry and sallow-looking skin, making it more prone to wrinkles. A smoking habit causes you to use your lips hundreds of times each day which may help to cause wrinkles. Continually drinking out of a straw may also foster the wrinkling of the skin. Sun Exposure – Use the sun wisely. Always protect yourself from overexposure. Outings that require long periods of sun exposure always require the application of a good natural and organic sunscreen with a sun protection factor (SPF) of at least 15 to all exposed areas of skin, especially the face. Chemical-laden sunscreens add chemicals to the body and are not healthy for the skin or for your health. Exercise regularly – The skin gets its nourishment from the bloodstream, thus requiring good circulation. Exercise increases the circulation of blood to the skin. We recommend a 30 minute walk every day and bouncing on a mini-tramp 10-15 minutes per day. Hormone Balance -- Virtually all women who live in an industrialized country (i.e. the United States) are at a large risk of estrogen dominance because of exposure to xenoestrogens. Xenoestrogens, mostly petroleum based synthetic estrogens, are present in tremendous amounts in our food chain, water supplies, and especially the environment. Unbalanced hormones tax the whole body and accelerate the aging process. We highly suggest saliva testing your hormones. Skin Toners – Natural ingredient skin toners are great for refreshing the skin. They are also good for freshening-up your make-up. We recommend all-natural Hydra-Tone™ for healthy and refreshing skin toning. Oxygen Facial – Perform an oxygen facial using our Oxy-Balm™ oxygen facial balm one-two times weekly. Using clean finger tips and circular motions, rub Oxy-Balm™ into the skin right before bed. Your skin will be moisturized and very soft the next morning and the cells of your skin will be rejuvenated. Facial expression habits – Squinting, raising your eyebrows, or making other potentially wrinkle-inducing expressions over and over again may cause wrinkles. Cleansing – Use natural cleansers such as HydraCleanze™ to cleanse and remove dirt and makeup. Do not scrub facial skin but instead apply gently to your face and rinse it off with warm filtered water. Tap water contains chlorine and fluoride and other harmful chemicals which are not only toxic to your body but can also damage and kill skin cells. Cosmetics – Use natural/organic cosmetics and use them sparingly. Replace cosmetics every three months. Wash all application brushes weekly. Moisturizing & Anti-Aging – Use Purely Ageless™ daily as an under make-up moisturizer and as a nightly aging defense crème. You will notice the amazing difference in your skin within one to two weeks! Organic Aloe Leaf Juice (Aloe Barbadensis) - Aloe leaf juice is packed with vitamins A, C, E, B1, B2, B3, B6, B12 and folic acid. It’s also rich in minerals like calcium, magnesium, zinc, iron, selenium and potassium. When used topically aloe leaf juice can soothe inflamed skin and enhance collagen and hyaluronic acid to help rejuvenate skin. Organic Shea Butter - What makes Shea butter an extraordinary skin care ingredient is its richness in unsaturated fats with a large proportion of "unsaponifiables" components, essential fatty acids, phytosterols, vitamin E and D, provitamin A and allantoin. All these constituents occur naturally making Shea butter a superfood for your skin. More skin care benefits of organic shea butter include: Smoothing the appearance of wrinkles, fine lines and scars, antioxidant properties, anti-inflammatory properties, deep moisturizing, stimulates microcirculation, skin strengthening, skin protecting, UV protecting, skin regenerating, collagen production stimulating which makes the skin stronger, more supple and younger looking. Vegan Emulsifying Wax - Emulsifying wax binds together oil and water, and does it so effectively, it is the most widely used ingredient in cosmetic formulations. Glycerin - Glycerin, also called glycerol, can be used on all types of skin including oily skin. It is used to treat many oily skin conditions, like acne, skin infections and the appearance of wrinkles and fine lines. Glycerin attracts moisture onto your skin which is why it is considered a humectant. Witch Hazel Water - Witch hazel water has been used for hundreds of years for skin care. Some of its skin care benefits are: tightening pores, acne, anti-aging, treating sunburn, psoriasis, eczema, puffy eyes, redness and swelling. Organic Cocoa Butter - Cocoa butter is a natural moisturizer that is high in fatty acids which penetrates the skin for deep hydration. It is rich in antioxidants including oleic acid, palmitic acid, and stearic acid. These fatty acids provide a layer of protection from skin stressors and free radicals which helps to slow the process of aging while acting as a mild sunscreen. Because cocoa butter will also slow the development of wrinkles, you will reap the benefits for years to come. Vitamin E - Vitamin E is a fat-soluble antioxidant that is essential for the maintenance of healthy skin. Naturally occurring vitamin E is not a single compound; instead, vitamin E is a group of molecules with related structures, some of which may have unique properties in skin. Topical application can also supply the skin with vitamin E and may provide specific vitamin E forms that are not available from the diet. As an antioxidant, vitamin E primarily reacts with reactive oxygen species. In addition, vitamin E can also absorb the energy from ultraviolet (UV) light. Thus, it plays important roles in photoprotection, preventing UV-induced free radical damage to skin. Vitamin E may also have related anti-inflammatory roles in the skin. Mango Butter - Mango butter is best known for its moisturizing essential fatty acids. It is rich in both oleic acid, a mono-unsaturated omega-9 acid and stearic acid, a saturated fatty acid. These are ingredients provide the most help in adding moisture to the skin as well as tightens and firms. Other ways mango can benefit your skin are: Keeps skin plump: Because of mango's rich vitamin C content, it can encourage a more plump and tighter look as well as promoting a firmer appearance on skin. Natural source of vitamin A: Natural Vitamin A encourages a revitalized, glowing look and helps reduce the appearance of fine lines and wrinkles while increasing skin’s overall youthful look. Helps dry skin: Dry patches, flakiness, and even sensitive skin and lips can benefit from mango butter because of its deep moisturizing ability. Smooths the appearance of fine lines and wrinkles: Mango butter provides a more lasting type of moisturization, which can help reduce the appearance of fine lines and wrinkles as you age. Organic Extract of White Willow Bark - White Willow Bark Extract is considered a multitasking botanical powerhouse. Exfoliating - Willow bark contains salicylic acid, derived from salicin, which helps to fight acne and is an all natural, gentle exfoliant. White willow bark helps to exfoliate your skin by sloughing off dead skin cells, making way for fresh, bright and radiant skin. Astringent and Anti-inflammatory - The astringent properties of white willow bark are due to the tannins present. Similar to those found in green tea extract, tannins are rich in anti-oxidants, help to tone and reduce inflammation, making white willow bark also an effective additive for reducing redness in skin. Balancing & Cleansing - Willow bark is also an effective botanical for cleansing by controlling sebum production and helping to unclog pores. Organic Rosemary Leaf Extract - Organic rosemary leaf extract has been shown to help balance oil production, speed wound healing, reduce the appearance of fine lines and protect against signs of premature aging. Rosemary leaf extract has powerful anti-inflammatory and anti-microbial properties and has been shown to help skin tone and speed wound healing. Organic Sunflower Seed Oil - Sunflower oil in skin care provides many benefits far beyond the nutrients it contains. However, not all sunflower oil is created equal. For reference, we’re talking about high-oleic, cold-pressed, organic sunflower oil, the only kind used in our skin care products. Organic sunflower oil has been shown to contain higher concentrations of antioxidants. Sunflower seed oil contains essential fatty acids—including linoleic, oleic, palmitic, and steraric acids—which are perfect for tightening and firming your look, promoting skin that has a soft, smooth appearance. Sunflower oil also contains natural vitamin C, vitamin E, vitamin K and amino acids. In skin care, vitamin K plays a major role in wrinkle reduction by preventing the hardening of elastin, the stretchy protein that gives healthy skin its soft, springy texture. Amino acids are like fuel for your skin’s natural renewal process: as cells divide to produce collagen, elastin, new skin cells, and other components of healthy skin, they need enough amino acids “in the tank” to continue functioning properly. Organic Neem Oil - Organic neem oil is rich in natural nutrients that are extremely beneficial for those who have eczema, psoriasis and dry, itchy skin. It's antibacterial and anti-fungal properties help to heal small cuts and wounds, alleviate acne symptoms and fight skin-related fungal infections. A 2011 research article published by the Department of Biochemistry and Biotechnology at the Kwame Nkrumah University of Science and Technology (KNUST) stated that neem "stimulates collagen production, good for aging skin," and that the Vitamin E in neem "acts as a free radical scavenger, by hindering the oxidizing processes in the skin. It promotes soft and supple skin, helps in reducing old scars and promotes healing." Vegetable Stearic Acid - A vegetable derivative used to stiffen and stabilize lotions and creams. Occurs naturally in vegetable fats. A white, waxy, natural fatty acid. Xanthum Gum - A polysaccharide derived from non GMO fermented corn sweeteners. Used as a safe thickener for cosmetic products. Tetrasodium Glutamate Diacetate - Tetrasodium Glutamate Diacetate is a multi-purpose, clear, liquid, mild chelating agent and preservative booster. Tetrasodium Glutamate Diacetate is made from plant material, readily biodegradable, with high solubility over a wide pH range. Phenoxyethanol - Phenoxyethanol is used as a preservative in skin care and cosmetic products to limit bacterial growth. Clary Sage - Used to help calm the nervous system, especially during times of stress, depression, and insomnia. Helps regulate oil production and reduce inflammation that contributes to dermatitis. Jasmine Absolute - Can improve your state of mind by inducing confidence, optimism, and euphoria. It helps banish fear, guilt, and stress. The aroma of the oil helps relax and uplift the spirit. Helps in treating dry or dehydrated skin, eczema, and dermatitis. Also has antiviral and germicidal properties. Bulgarian Rose Absolute – Rose absolute oil is traditionally calming and uplifting, and has anti-inflammatory, cooling and soothing properties. It works well for dry, hot, inflamed, or itchy skin. It can also work well for preventing scarring, treating broken capillaries, and even for relieving stress. Studies have also shown rose oil to have antimicrobial properties. Ylang Ylang - Ylang ylang oil helps relax the body and soul, and may be helpful for people suffering from insomnia, fatigue, and frigidity. This essential oil has been proven to help regulate the production of sebum, an oily substance secreted by the sebaceous glands, to protect your hair and skin from drying out. It has many cosmetic uses, including: maintaining skin moisture and clearing and healing acne. Neroli - Neroli helps improve skin health by regenerating and keeping your skin elastic, preventing the appearance of stretch marks, banishing acne, reducing the appearance of scars, and helping heal broken capillaries. Neroli is valued for its calming and relaxing scent, which acts as a tranquilizer that can help alleviate anxiety and heart palpitations, relieve insomnia, and even prevent or treat stress-related depression. Its fragrance can also help alleviate digestive issues, such as intestinal spasms, colitis, dyspepsia, and diarrhea. Geranium – Geranium essential oil is used to treat acne, sore throat, anxiety, depression, and insomnia. Its users are mainly for women due to its rosy smell and its beneficial effect on menstruation and menopause. The essential oil can also uplift mood, lessen fatigue, and promote emotional wellness. Geranium oil also functions to reduce pain and inflammation. Its antiseptic properties can help speed up the healing of wounds and treat a variety of skin problems, such as burns, frostbite, fungal infections, athlete's foot, and eczema. Lavender - Lavender oil is known for its anti-inflammatory, antifungal, antidepressant, antiseptic, antibacterial and antimicrobial properties. It also has antispasmodic, analgesic, detoxifying, hypotensive and sedative effects. Treat various skin disorders like acne, psoriasis, eczema and wrinkles. It also helps form scar tissues, which may be essential in healing wounds, cuts and burns. Lavender can also help soothe itchy skin. According to Texas-based dermatologist Dr. Naila Malik, it's a natural anti-inflammatory, so it helps reduce itching, swelling and redness. Sweet Orange Essential Oil - Sweet Orange Essential Oil is antiseptic and anti-inflammatory which makes it an ideal ingredient in your skin care routine. Sweet orange is great for acne-prone skin and has been shown to increase the ability to absorb vitamin C and encourage collagen production and blood flow, all of which are essential for anti-aging. For endless hydration and nourishment: After cleansing and toning (morning and night) apply a small dab of Purely Ageless to forehead, cheeks, nose and chin. Rub into skin using circular, upward motion with gentle touch. Don't help gravity by tugging down on your skin, and remember that the skin on your face, especially around the eyes, is very delicate. Make sure your hands are clean before applying Purely Ageless. Store at room temperature (68 - 75 F). Make sure your container is tightly closed after each use. Protect your product from moisture, extreme temperatures, and direct UV light. Are the essential oils used in Purely Ageless™ therapeutic grade essential oils? Therapeutic Grade is a marketing term used by some companies to differentiate their Essential Oils in a crowded marketplace. The term is unregulated, and there is no standard by which to judge an essential oil in this manner. Don’t be fooled or swayed; either an essential oil is pure and unadulterated, or it is adulterated. It is either Certified Organic or it is not. It truly is that simple. The essential oils used in Purely Ageless™ are pure and unadulterated and wild-crafted, naturally farmed or organic. Does Purely Ageless™ work for all skin types? Purely Ageless™ is formulated to work on all skin types: normal, dry, oily, acne-prone and sensitive skin. Although Purely Ageless™ begins to work immediately, everyone's skin regenerates at a different rate and you should allow at least 30 days of continuous daily use to see outward signs of improvement. Should Purely Ageless™ be kept refrigerated? Purely Ageless does not require refrigeration. However, many women have told us they like to keep Purely Ageless in the fridge, especially during warmer months, because they like the refreshing feeling of cool on their face - both morning and evening. How long does one jar of Purely Ageless™ last? What is the purpose of phenoxyethanol in Purely Ageless™? Phenoxyethanol is used as a preservative in skin care and cosmetic products to kill bacteria, mold, fungus and other microbes and keep them from forming. All personal care products that contain water and/or hydrosols need a preservative to inhibit growth of harmful bacteria and fungi that can make you very ill. If you do not see a preservative or preservative system listed for a product that contains water and/or hydrosols, either a preservative is not being used or all the ingredients are not being listed or both. There is no free phenol in phenoxyethanol. So if you read a negative review of phenoxyethanol and they specifically call out “phenol”, you can assume the author does not understand the science and facts involved in the basic chemistry. Infants should not be exposed to cosmetic products containing Phenoxyethanol. Most people are not allergic when phenoxyethanol is used at under 2.2%. We use less than 1%. If you are allergic, be sure to read labels and avoid personal care products and vaccines with phenoxyethanol and since parabens may enhance the allergic effects of phenoxyethanol, you should skip products containing both. NOTE: Looking at phenoxyethanol on EWG Skin Deep, we notice it’s getting a score of 4 (0 being the least hazardous to 10 being the most). It’s important to remember that EWG's score is for the material itself in its most concentrated form, not for products containing that material. Since toxicity correlates to dosage, using such a material at the very low levels common for preservatives (phenoxyethanol's function in cosmetics) means that the actual risks presented are extremely low. Unfortunately, consumers will read this rating and make assumptions which are often incorrect. Skin Deep is not vilifying phenoxyethanol with the score of 4, all they’re doing is showing the facts of a single ingredient when used by itself with no other ingredients involved. While we do consider the EWG Skin Deep site when looking at ingredient safety for our skin care products, it is our wish that Skin Deep would do a better job of explaining that their scores are related to the stand-alone ingredient; this would definitely provide more correct information to consumers and make the formulator’s lives a little easier.